Back to Gn15! With a mining wagon exchange. After much thought if to create this layout in 1/12 or 1/24, I've opted for the latter because of space, and the fact I can fit in more structures. It's good to get back to this scale after all the fun of 1/12. Whilst in England I purchased some Peco Settrack double straights, easier to get in the suitcase. As well as bring back two Hornby J94, for chassis donars. These will be used as the basis for the layout's Gnew locos. By the way, how do you take the bodies off these things? I want to create a wagon exchange layout. With wagon(s) being shunted on and off a wagon traverser between two gradients. I'm a bit unsure how I'm going to build the wagon traverser? Any advice or ideas would be really great. I look forward to hearing your thoughts on this project. It should be a fun ride. dieselwater wrote: As well as bring back two Hornby J94, for chassis donars. These will be used as the basis for the layout's Gnew locos. Got a photo of the bottom of one of them? I can usually figure these things out. I've seen some small scale (haha...like 1/24 is small!!! ) traversers where there is a threaded rod and then a Gnut attached to the underside of the traverser itself. Then it could be hand crank or motorized. I Gnow there are quite a few on the Carl Arendt site. Hey....this will be something Gnew for the Crittershacks to run on! Underworld: It's looking at all the wonderful layouts and plans on Carl's site that has given me the inspiration. Thanks Michael those are great pics. The J94 is useful, and the mining pics are full of inspiration. Tons of atmosphere! Both perfect examples of the type of traverser I was thinking of. I think Les's has the more heavy duty look that would be able to shift loaded up spoil wagons all day n night. I'll probably end up with something that is a combination of both. Interesting idea with the gradients. 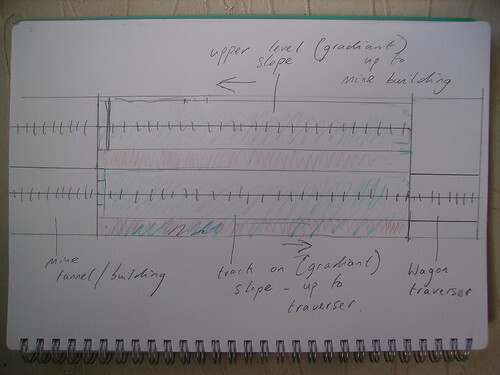 But if the tracks are in gradients and the traverser is horizontally, you have horizontal breaks/bends (or whatever is the correct term ) in the track. OK, with four-wheeled locos this may work, but usually there is a radius between gradient and horizontal track to avoid derailments and uncouplings. I'm not really sure on the extent of the gradients. They would probably be fairly gentle. They would have to level out a little way before each end, I'm thinking. Regarding the track I'm hoping to replace the sleepers with some chunkier wooden ones. And I'll probably bury them in some places too. To be honest, this is all Gnew to me, regarding track and traverser building. Fun stuff! I would go with Michael and say to keep it flat on such a small layout, you dont really have the space for much in the way of transition between gradient and flat. Also it would be a nightmare with most forms of couplings, plus the only place to park a wagon would be on the flat areas. Your Simplicity sidings layout will be showing me the way for this Steve. I've seen some blue foamcore in the art shop here. It seems the ideal candidate for the baseboard. teetrix wrote: The traverser rolls on a gradient up and down, and the tracks are lying horizontally, but in different heights. The alignment on Jaxcilliest is taken care of by using K&S 3/16" square brass RHS (#153) attached to the cage running inside K&S 1/4" brass channel (#1185) attached to the structure. The brass/brass interface is reasonably slippery. This is enhanced by a dusting of dry graphite lubricant. The trick is to lay your track in the cage/on the incline table and then lay your track to the cage when it is in postion at each level. Use either a rotating screw as previously suggested or you can use the Tamiya chain/gearbox combination I used to move the incline table. Last edited by Oztrainz on Tue Jan 19, 2010 10:45 pm, edited 1 time in total. Material exits mine, stage left pushed by a beat up critter to transfer incline. Human hand pushes (or pulls) transfer table up incline via rod in foreground. Critter in right "tunnel" pushes cars to left into base of processing building. Ore is processed and moves up to be shipped in larger cars pulled by larger loco towards stage right. Strong industrial forms bracket composition: concrete transfer table with operator house and power equipment on one side, ore processing "tower" on left side. Ravine at center gives impression of distance and a good reason to use some cheap, N or HO bridges or trestles. Rear masonry "wall" is meant to be blasted ledge, not laid-up stone. Angle lines a bit in plan view. The top level route is supposed to curve towards the viewer above the power station on the right. You might find a good reason to park a coal car or oil tanker above the transfer table power station? Maybe add a line of telephone/elec line poles in silhouette across the top level? If you wanted to be fancy, you could continue the mine rail line in a 180-degree turn to the rear of the layout. Even put an over-run under the powerstation or return that 180 degrees to rear as well. Size? Could it be 15" x 36" ? Maybe I'm too optimistic...? Last edited by JT Previa on Sun Apr 14, 2013 3:18 am, edited 1 time in total. I need to go and get a soldering iron etc. What type would be best? Thanks. 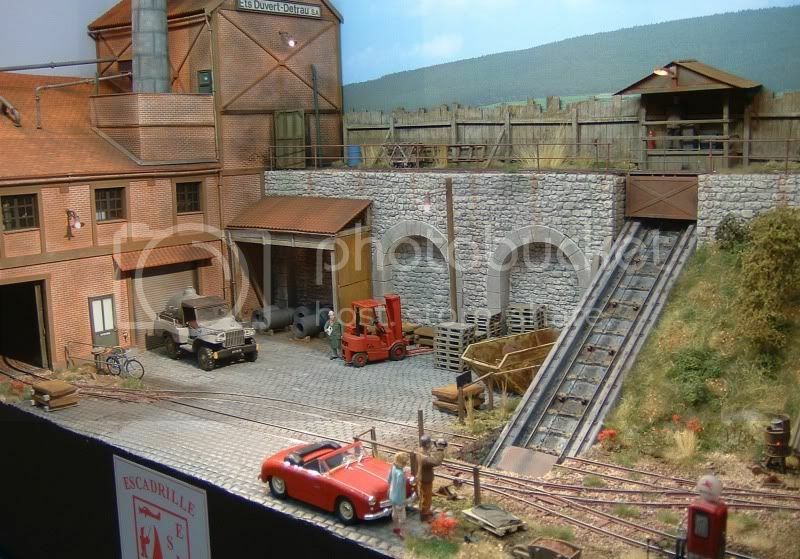 There are some wonderful layouts on display there! This demonstrates the possibilities perfectly. It's very useful to be able to compare it with JT's smashing plan. Thanks Chris, These pics show great detail, that will be very useful in designing and building the traverser. I remember talking to the operator of this layout and taking a look at the mechanism which he used. It is totally manual and utilises meccano components. The harder thing to work out is how you are going to uncouple the wagon on the moving platform. I thought that you might want to see the following taken at Expong 2005 and from what I can remember is 0n14 and built by someone in France. Sorry can't remember anymore details. I have a few more photos and can post if useful. Wow! 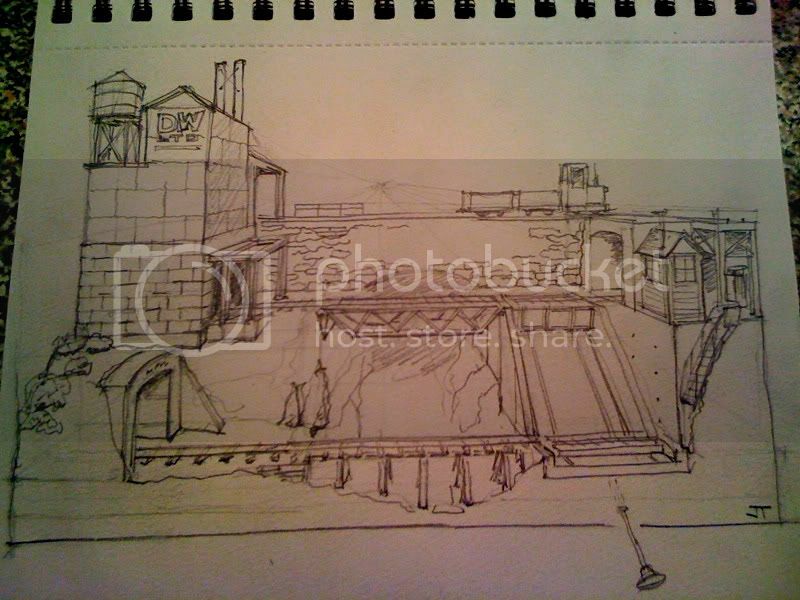 (I swear I did not see that French layout before sketching out my idea...!) That is excellent modeling. Thanks Richard. Cool inclined ramps all around, typical response from the Gnatterbox crew. Now David must have some serious pent-up modeling, I haven't seen a new critter in weeks! mud magnet wrote: I thought that you might want to see the following taken at Expong 2005 and from what I can remember is 0n14 and built by someone in France. Sorry can't remember anymore details. I have a few more photos and can post if useful. 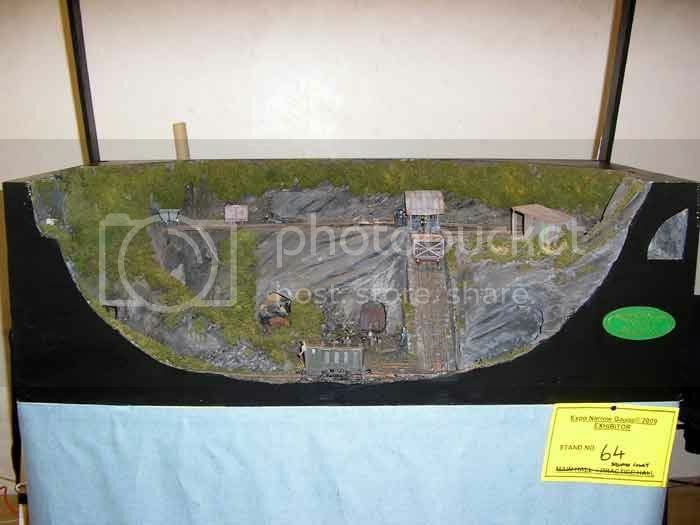 I want the scenic part of the layout to be no more than A2 size, if possible. I still need to get a soldering iron. What type do you chaps use? Oh and while planning the layout... I'm going to get on with the first critter for it. JT you're right, it's been way too long since the last one! I find building a critter really inspires the layout. Plus you have something to check clearances with etc.